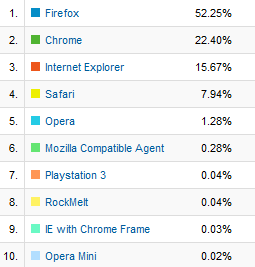 RBN Releases » Blog Archive » So, uh, what browser do you use? I’ve been on Chrome and Firefox 4 here and both run smoothly. Chrome even remembers my place when I’m scrolling through pages of songs. It’s true, but Analytics used to give a view that showed the browser breakdown comparing all browser (major) versions at once, which was really nifty. I don’t know where that went. In any case, of IE visitors so far, 80% are using IE8, 17% are using IE7, 2.5% are using IE9, and .5% are using IE6(! ).